The 2019 Blazer is expected to go on sale early next year in three trims -- base, RS and Premier. 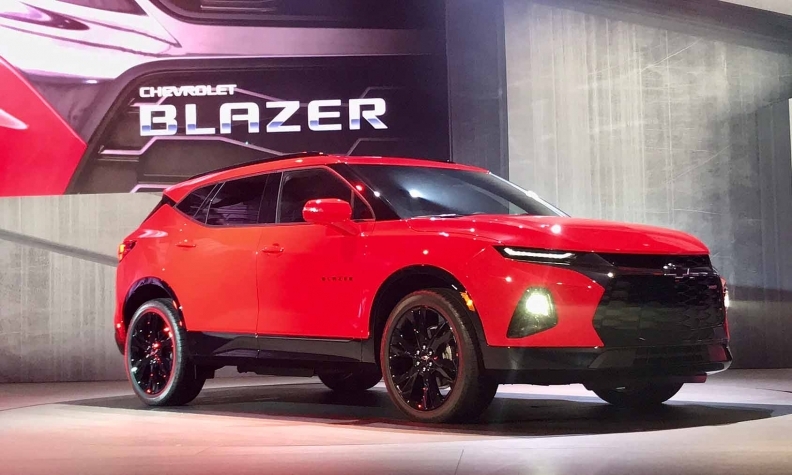 ATLANTA -- General Motors, aiming for more gains in the booming American market for utility vehicles, is resurrecting the venerable Chevrolet Blazer nameplate as a tech-savvy, yet sporty, crossover. The new midsize Blazer, which GM last produced in 2005 as a body-on-frame SUV, will slot between Chevrolet's compact Equinox and large Traverse crossovers -- both of which were redesigned for 2018 and helped GM post record U.S. crossover sales last year. 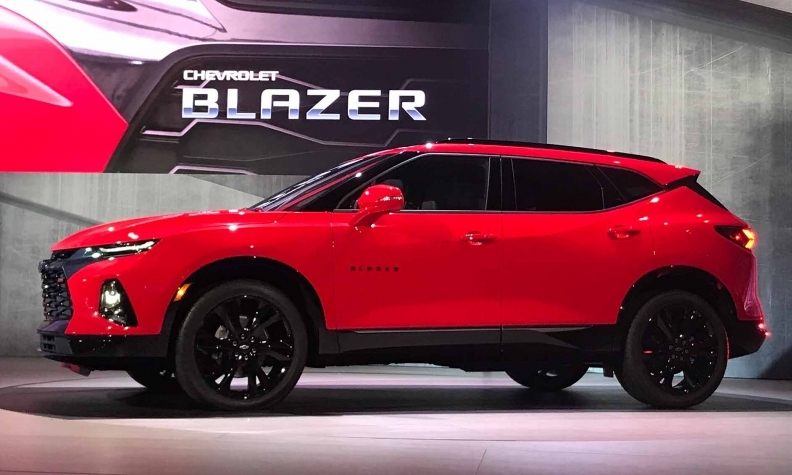 "The introduction of the all-new Blazer builds on that momentum and further strengthens the most comprehensive lineup of crossovers and SUVs on the market today," Alan Batey, president of GM North America and head of Chevrolet's global business, said in a statement. Canadian and U.S. consumers are migrating from cars to crossovers, and Chevrolet hopes to capture more of those buyers by offering another utility in a key segment dominated by the Honda Pilot, Ford Edge, Nissan Murano, Hyundai Santa Fe and Subaru Outback. From 2013 to 2017, U.S. sales of midsize crossovers increased 24 per cent, according to the Automotive News Data Center. The segment has expanded 4.4 per cent through the first five months of 2018. The 2019 Blazer is expected to go on sale early next year in three trims -- base, RS and Premier --and introduce a simpler trim strategy for the brand. The trims, GM says, will offer "distinct styling," including custom grille appearances and chrome. The five-passenger crossover has been designed in line with recent vehicle updates in Chevrolet's lineup but adopts a much more aggressive, sculpted approach. It features a prominent dual grille similar in shape to that of the refreshed 2019 Camaro SS and sleek, horizontal LED daytime running lights between the headlamps. 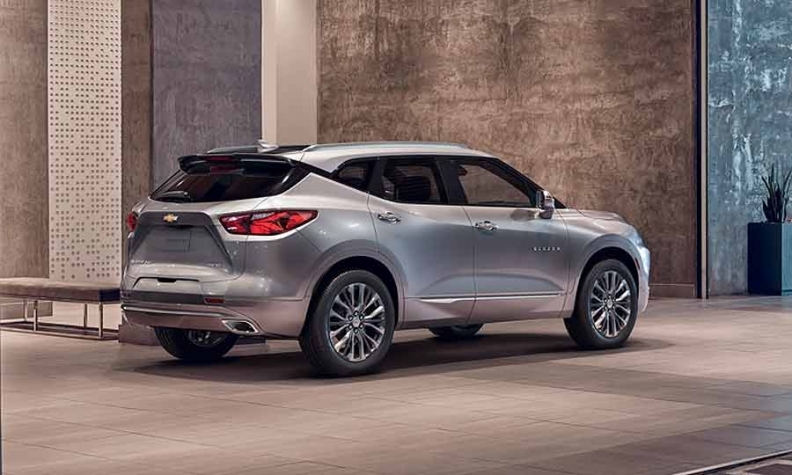 John Cafaro, executive director of Chevrolet design, said the vehicle was styled with "attitude" while "fulfilling the promise of versatility at the heart of every Chevy crossover and SUV." Powering the front-wheel-drive vehicle will be a standard 2.5-litre inline-four engine rated at 193 hp and 188 pound-feet of torque. A 3.6-litre V-6 engine is also available, offering 305 hp and 269 pound-feet of torque. Both direct-injected engines feature intelligent stop-start technology and are paired to a nine-speed transmission. The Blazer's maximum trailering load is an estimated 4,500 pounds with the V-6 engine. GM will produce the Blazer at a plant in Ramos Arizpe, Mexico, alongside the Chevrolet Equinox crossover and Chevrolet Cruze hatchback. It is based on GM's C1XX regular-wheelbase crossover platform, which also underpins the Cadillac XT5 and GMC Acadia. A longer wheelbase is used on the 2018 Chevrolet Traverse and 2018 Buick Enclave. Pricing will be announced closer to the start of production in the fourth quarter. Traction Select is standard on all models and allows real-time adjustments to the vehicle's driving mode. On all-wheel-drive models, it also allows the system to be completely disconnected from the rear axle, meaning drivers can opt to have their vehicle operate in fwd when awd is not needed. An advanced twin-clutch awd system will be available on RS and Premier models. 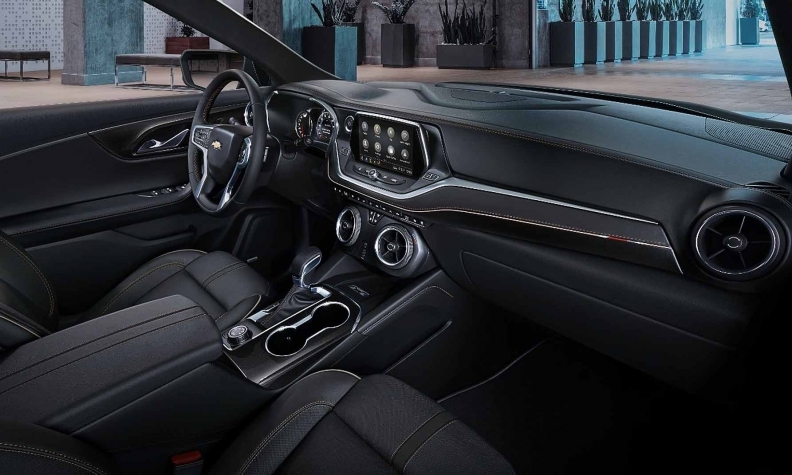 Inside, the vehicle will come standard with an 8-inch color touch screen with Chevrolet Infotainment, 4G LTE Wi-Fi and Apple CarPlay and Android Auto compatibility. On RS and Premier models, a new Chevrolet cargo management system, with a rail and cargo fence to help secure smaller items by dividing the cargo area, will come standard. Available features (mostly available on RS and Premier) include advanced hitch guidance systems, electronic-locking glove box, heated outboard rear seats, adaptive cruise control and wireless charging. GM introduced the K5 Blazer name in 1969 as part of the famed Chevrolet C/K truck family. The automaker says it has sold more than eight million Blazers, with annual U.S. deliveries routinely topping 200,000 from the mid-1990s through 2000, according to the Automotive News Data Center. The nameplate was discontinued in early 2005 amid sluggish demand for truck-based SUVs, rising gas prices and a shift in consumer preferences to sport wagons or crossovers.